This is not bad release, just a bad vocal mastering on the A side. Do not confuse people, please. And yeah, Jovonn is a house legend. If you have bad ears, Magnetonium, do not try to downplay Jovonn's name. Silly, bloated prices. Sellers, check the median sale price which is a little more than 50 bucks. Then take a deep breath and wipe the dollar signs outta your eyes. The reissue is on its way. This Thing Is Jammin' is nice but overall this release is over-hyped. Repress will be out on Clone Classic Cuts soon! Repetitive or not ,"This Thing Is Jammin' " is a legendary track anyway. Let me shatter some illusions here. I am a huge garage fan, but this release is absolutely terrible. It sounds too disco-ish at times - or too simple, repetitive and boring. 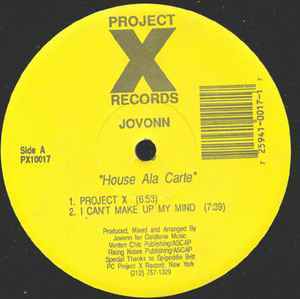 Someone has elevated Jovonn to the status of a house legend, but to me there are many other better producers, such as Jerzzey Boy, Kerri Chandler, Masters At Work and Mood II Swing. Just because it says "Jovonn", doesn't mean that this is a great release. Its a disappointing EP. Save your money. There are many other better "underground" garage house gems from early 90s that are worth buying.